In the early 2000s, gherkin cultivation was at its peak and the fruit was exported to countries around the world. But with consecutive crop failure and lack of support, farmers are now turning their backs on the once-golden fruit. 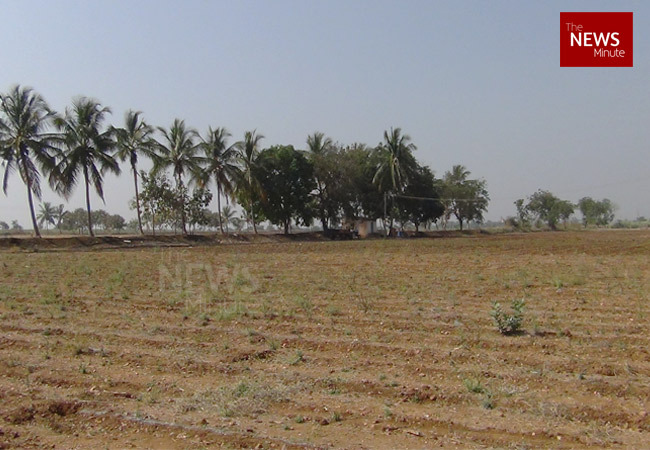 Withered crops and barren fields dot Thimmapur village in Karnataka's Ranebennur. Four disgruntled farmers sit in a field; their faces etched with worry. The district is among the largest cultivators of gherkins in India, yet the farmers looked doubtful when asked about the fruit. "What? We don't cultivate jerkins. We buy them in the store," says 34-year-old Nilappa Hadinavar. After a convoluted conversation about the characteristics of gherkins, Nilappa's eyes light up with realisation. "Why could you not say sanna southe plant (tiny cucumber)? Yes, we do grow those here but we don't want to any more," he says. Hundreds of farmers in the region, including Nilappa, cultivate gherkins, a kind of small cucumber grown exclusively for export. Cultivated across 20 districts in Karnataka, these gherkins have ended up in restaurants and homes across Russia, the United States and several European countries. But, in recent years, the once-valuable gherkin has fallen from grace. Walking across his six-acre plot, Nilappa speaks of how gruelling life has been in the past four years. Consecutive crop failures as a result of unpredictable rains, dry borewells, pests and insufficient support from factories have left farmers distraught and riddled with debt -- a turnaround from 12 years ago when farmers such as Nilappa believed gherkins would lead to a better future. Nilappa was 22 years old when he was introduced to the gherkin. "I still remember that day. My friend Barmappa and I were sitting outside the tea stall near the bus stop when a man got off a bus. He approached us and asked if he could talk to farmers in our village. His name is Seppy. I had never heard that name before. He told us about this magical fruit that could grow within a month's time and make us richer than ever," he says. Nilappa was starstruck. He felt it was a sign from Mother Earth, to whom he was ardently devoted. Seppy worked for Neo Foods, a gherkin producer, and most of the farmers in Thimmapur agreed to cultivate the fruit for export. “I knew it was destined. I went all out to cultivate this crop. He called it "southe plant" (cucumber plant) and told us that it was the crop of the future,” Nilappa recalled. In the 1990s, as Bengaluru witnessed the IT boom, another important phenomenon took place in rural Karnataka. With developed countries looking to outsource labour to countries like India, Karnataka became a hub for gherkin cultivation. Gherkins aren’t terribly popular in India, but in Europe and North America, they’re most commonly pickled and eaten as a condiment in burgers and sandwiches, especially in fast food chains such as McDonald’s, Burger King and Subway. Though it wasn’t going to be consumed in the state, Karnataka became an ideal place for the mass production of gherkins, mainly because of its ideal soil and temperature range. The early 2000s saw Nilappa and many other Ranebennur farmers reaping huge profits from gherkins, so much so that they began cultivating it thrice a year. 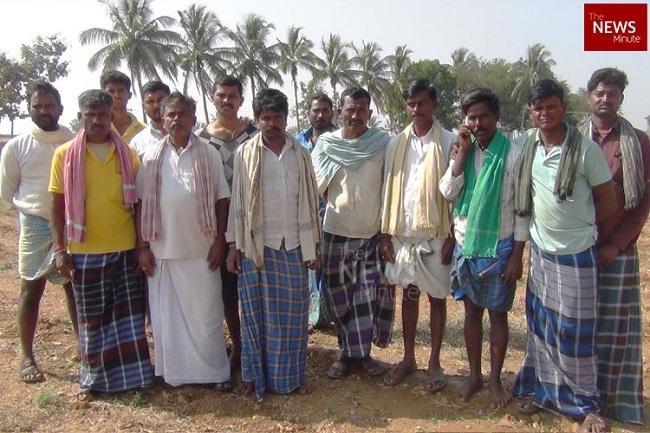 Nilappa and his friends did not face the problem of drought, as the Tungabadhra River irrigated their lands, ensuring the crops did not fail. Large export companies began recruiting agents, who, in turn, would go to villages in the hope of convincing farmers to accept the profit-making angel crop. The idea of easy money was naturally appealing to the farmers. Packed seeds would arrived from abroad, and all the farmers had to do was cultivate the crop and send it to the sorting centres in their villages. They would segregate gherkins into small, medium and large sizes, and hand them over to factories, where they would be pickled, bottled and packed for export. The gherkin industry in Karnataka was massive, with exports reaching 2,25,000 metric tonnes per annum prior to 2014. The pickled gherkins were sold to the USA, France, Germany, Australia, Spain, South Korea, Canada, Japan, Belgium, Russia, China, Sri Lanka, Israel and Estonia. That changed in 2014, when the Russian aggression in Crimea resulted in US-imposed sanctions on the country. This led to the devaluation of the Ruble. “It was the worst thing that happened to us,” says Madhusudhan, owner of Vishaal Foods, one of the oldest exporters of pickled gherkins in Karnataka. “We had huge crates of pickled gherkins waiting to be shipped out. But Russia did not buy it. We incurred massive losses that year. Our turnover was as less as Rs 180 crore, nothing compared to the hundreds of crores the industry was used to turn out,” he adds. Soon, Russia began encouraging local cultivation of crops and also turned to Vietnam, which was offering a much lower price than Indian exporters. With the loss of income from Russia, earnings dipped drastically, for Karnataka, which produces 60% of the gherkins cultivated in India. Though they began exporting to other countries in Europe, which helped regenerate the lost income. “we lost 40% of our earnings,” Madhusudan says. Along with the falling demand, bad weather conditions created an adverse situation for gherkin cultivation. "It started going wrong in 2015. The weather was not consistent. It would become cloudy too soon. The crop needed a lot of water and sunlight. The vagaries in the weather over the past few years resulted in major crop loss,” says Birappa Goravar, a 34-year-old farmer from Thimmapur. Barmappa, another farmer in Thimmapur, says that in 2015, the crops grew well only between August and October (during the monsoon). Two of his crops that year failed due to pest infestation. However, he was able to salvage some of them. “The following years too, although the crops did not completely fail, the yield was very low. Last year, not a single plant survived from the crop planted in December. It was like the plague had hit them: they withered and died,” Birappa says. In Ballari district’s Kottur area, Maabu Saheb’s gherkin farm is also in ruins. The gherkin vines look stunted and are infected with pests. The leaves are wilted and yellow in colour. “They call it Powdery Mildew. It’s like a virus infection in humans. If one is infected, it destroys each and every plant. All my crops have been destroyed this year because of this. Whenever the weather is humid and cloudy or when the temperature drops and the area is cold, these vines are susceptible to getting infected. There is no question of harvest,” Maabu laments. Currently, there are more than 1 lakh small and marginal farmers who are engaged in the production of gherkins in Karnataka. The contract farmers were told they would receive technical support from the companies as well as guaranteed buy back of crop at pre-declared prices, they say. But, Maabu, who sells his gherkins to Neo Foods, says that the company did not provide him with pesticides. “As per our contract, companies are supoosed to partly fund our input cost. Agent Madhukar told me my crop was going to fail and that it was pointless to save it,” Maabu alleges. Nilappa’s and Birappa’s farms too were riddled with pests. But, this time, it was Downey Mildew. Despite spraying pesticides multiple times a day, Nilappa and Birappa could not save their crop. “Look at this. It looks like hay, right? It’s the remnants of the gherkin I planted this year. This is what it has been reduced to. When this kind of infection spreads, the crop cannot be saved, no matter what pesticide we spray,” Nilappa says. 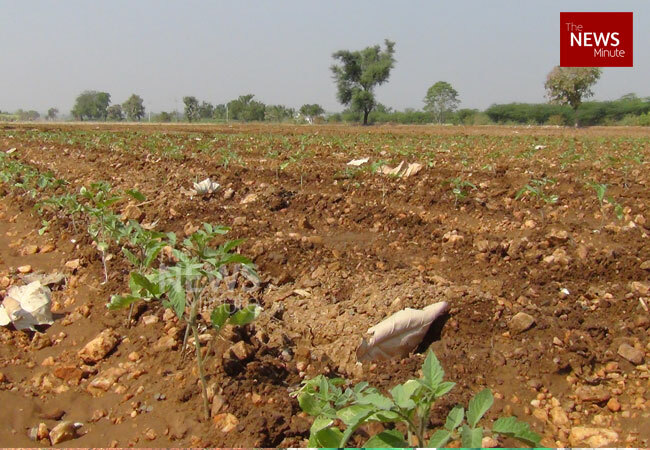 Unlike farmers Ranebennur, which is fed by the Tungabhadra river, gherkin cultivators in Tumakuru, Chikkaballapura and Ballari have incurred severe losses since 2015 due to water shortage and dry borewells. Gurraladinne, Doddamaralli and Dibbur villages, where gherkins were raised on a large scale in the early 2000s, no longer cultivate the crop. 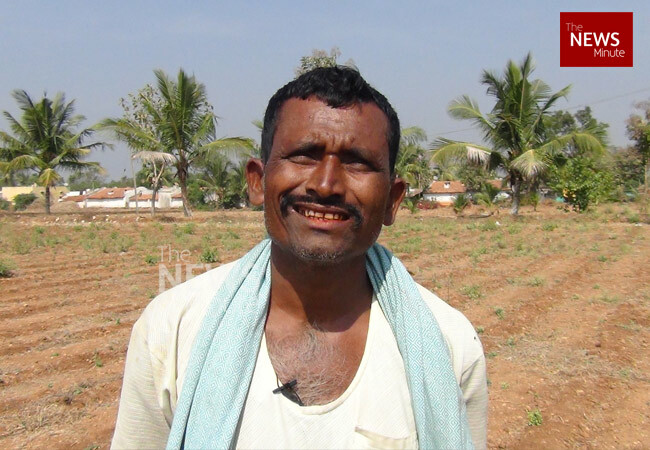 Speaking to TNM is Gangadhar, a 43-year-old farmer from Bagepalli in Chikkaballapura, who owns a 4-acre plot where he used to cultivate gherkins. Consecutive crop failure through lack of adequate water for irrigation has left him helpless. “So many farmers stopped cultivating gherkins in late 2017. The yield was not good and, in many cases, the borewells were running dry. The crop needs a lot of water and we just don’t have that anymore. Cotton and sugarcane require lesser water,” Gangadhar says. 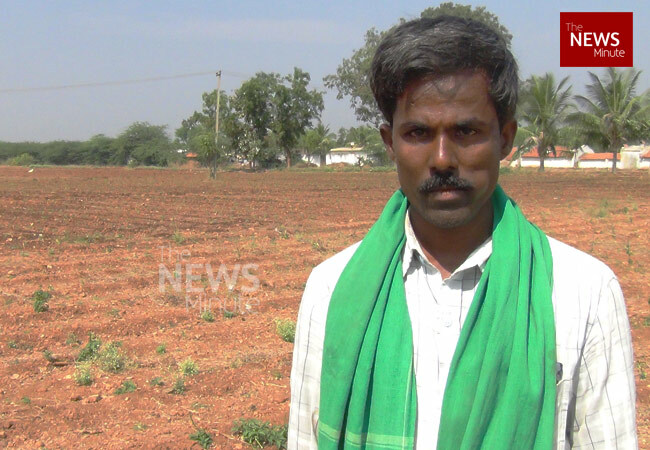 Gangadhar spent Rs 3.3 lakh on digging up borewells in 2018 but did not get a single drop of water. “I have incurred a lot of debt. In 2017 too, I sunk money on a borewell, but the water ran out very quickly. I am going to stop cultivating gherkins. It’s brought me only misery. I have over 5 lakh in debt and each year it keeps rising. I did not sign up for this,” Gangadhar says. “Growing gherkins requires a lot of manual labour. We have to pay each worker Rs 280 per day. We have to pay them for three months when the crop is being cultivated. In a year, ideally, we plant the seeds thrice. Between May and July, August and October and December to February. The costs are too high. In addition, we have to pay Rs 12,000 every quarter for pesticides,” Nilappa says. 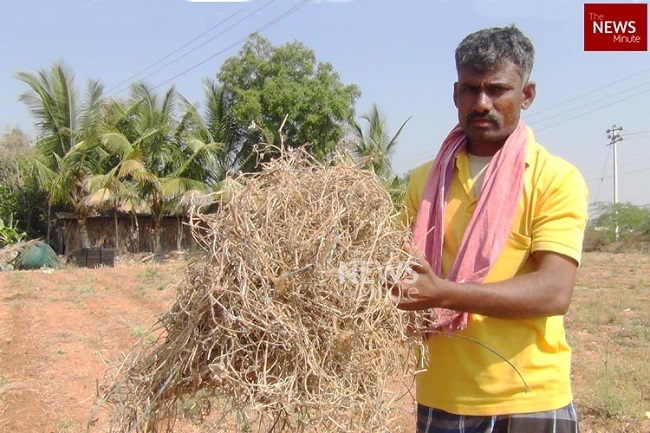 Just like Nilappa, farmers across Ballari, Chikkaballapura, Haveri and Davangere have incurred massive debts over the last few years. In the last three years, Nilappa says he has invested over Rs 2 lakh on the crops, but the yield has been low. He was forced to get a loan from a private money lender to pay off existing loans. The farmers’ only hope? The government’s proposed farm loan waiver. “It’s been two months since we applied for the waiver. The bank manager tells me that they have not received any notification for waiving off the loans. We don’t know whether the government’s promise is true or not, so I have no choice but to take another loan for the next farming cycle. I am thinking of cultivating cotton and that needs money,” Barmappa says. With farmers slowly opting out of gherkin cultivation, export companies too are worried. "We have spoken to the government officials and they are convinced that gherkins are an important crop for Karnataka. We have requested the government to help gherkin farmers install drip irrigation systems to combat water shortage," Vivek says. "The reasons for crop failure are weather, water and fly infestation. If we combat these, farmers will also generate more profits," he adds. Gherkin factory owners are also trying to procure better seeds for the summer and monsoon crops, says Vivek. He is also relying on state-run institutions such as the University of Horticulture Sciences to educate farmers in Bagalkot on the cultivation of exotic crops. Farmers like Maabu are still hopeful that the market for gherkin will rise again. Though he has yet to see a good crop of gherkins since he started cultivating the fruit four years ago, he’s not ready to give up.